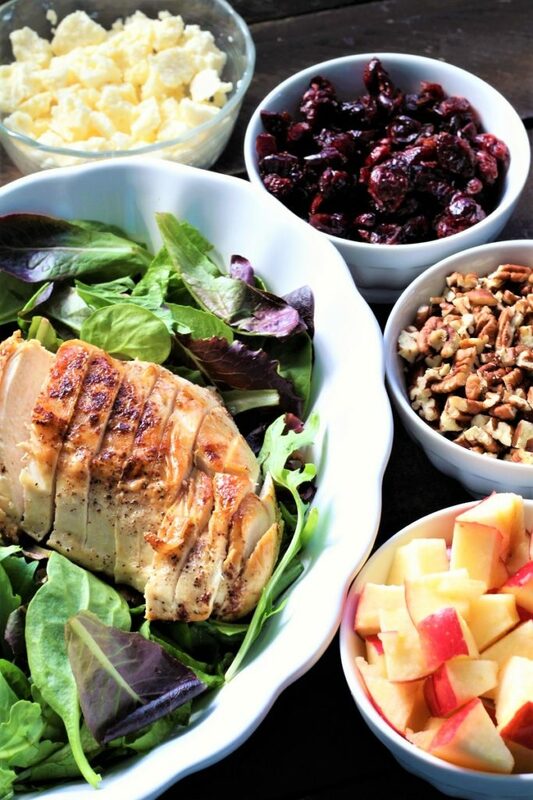 Autumn chicken pecan salad is to die for! I’m not kidding you, if you don’t have the ingredients; I would seriously get in the car and head straight to the store. 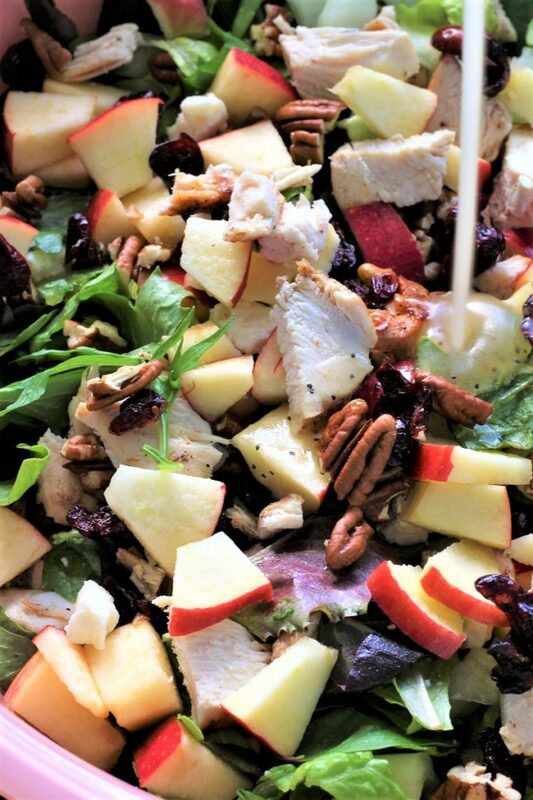 The apples and pecans give this salad such a nice flavor and a little crunch. So I like the salad that they have at Wendy’s that has chicken and pecans and so I decided to make my own. I really don’t love feta cheese, and I think that that is because I always eat it when I go out. This was perfect, not too much and nice and fresh. If you want a little more sweet, you could use pecans that are sugar coated, but I felt like the apple made it nice and sweet. Another thing that I did, was when I was frying up the chicken, I added a little cinnamon. It gave it a nice taste that blended very well with the rest of the salad. I used just a little and I know the saying goes, if a little is good, a lot is even better. Not in this case. A little was perfect. Plus, it sure did make the house smell good. Then, I used peanut oil and I was very pleased with the wonderful flavor that it gave the dressing. Peanut oil is a great oil for dressing. But you can use any oil that you want to for making the dressing. This salad make a whole meal. Add a slice of bread and you are good to go. Also, you could add Craisins instead of dried cranberries, but I really enjoyed the cranberries. 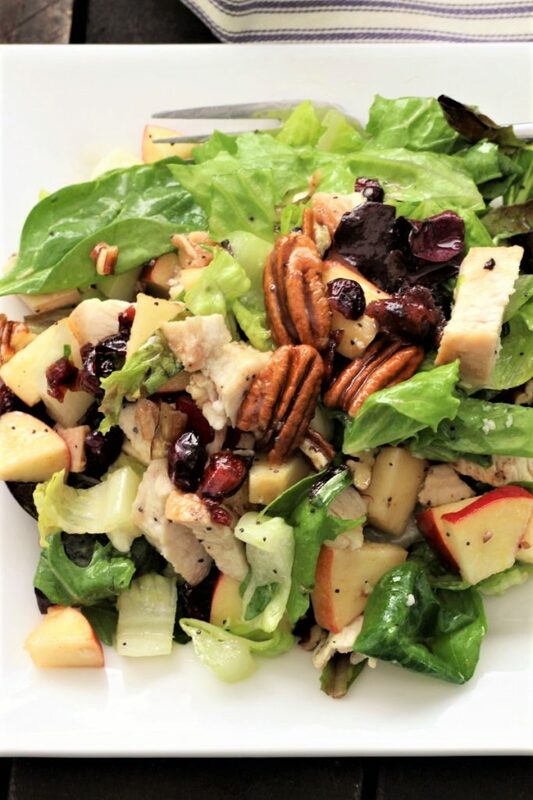 But remember if you make this Autumn Chicken Pecan Salad and then you go out to eat and get one, you will love yours a lot more. Happy eating! Place chicken breasts in a large skillet, over medium heat with about 1 - 2 Tbsps olive oil. Season the chicken with salt, pepper, and only on one side, cinnamon. Sprinkle the chicken with the seasonings to your taste. I used about ⅛ tsp of cinnamon on each chicken breast. Cook until fully cooked. Let the chicken cool while you make the rest of the salad. Then cut the chicken into cubes. Wash, dry and chop romaine lettuce. Place the lettuce in a large bowl, then add the spring mix. 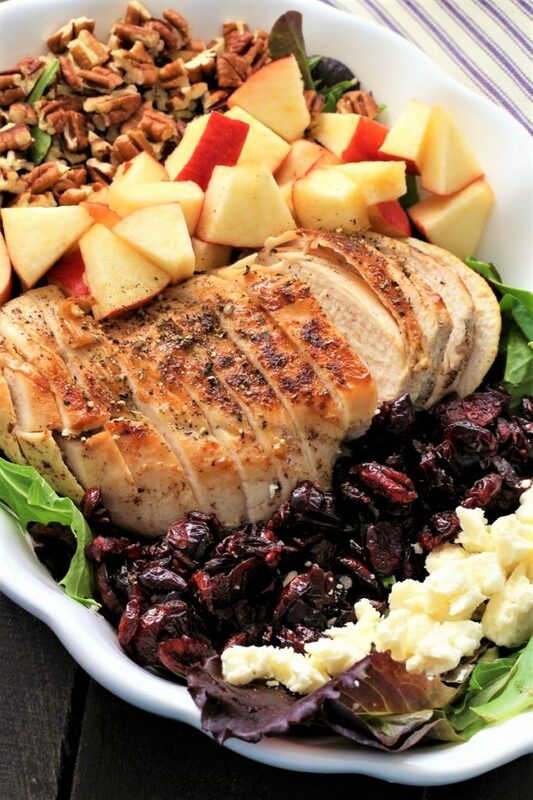 Add the chopped apples, cranberries, pecans, crumbled feta and the cubed chicken. In a shaker bottle or the blender, combine poppy seeds, dry mustard, vinegar, salt, oil, dried onion, and the sugar. I like to make the dressing ahead of time, and store in the refrigerator so that the flavors season together, at least one hour ahead, but that is not necessary. Mix the salad together gently. Add the dressing right before serving. 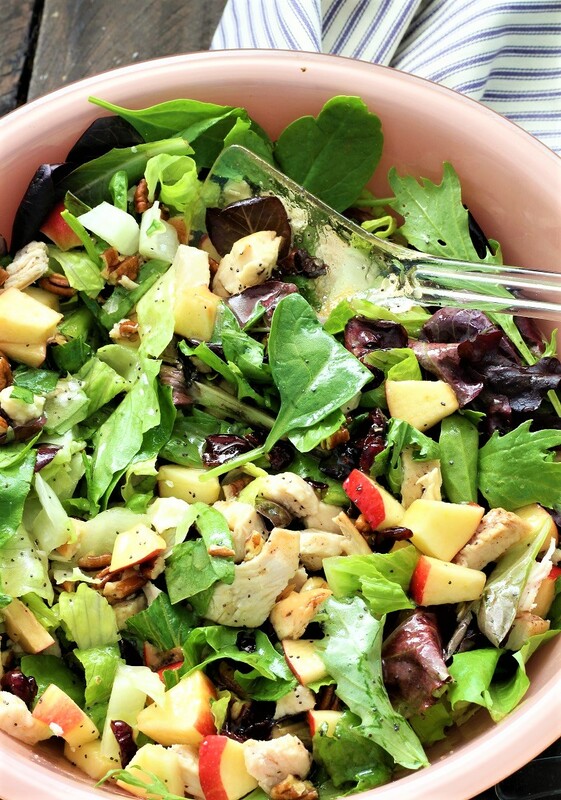 Now that is one GORGEOUS salad! Thanks for sharing with us at the To Grandma’s House we go link party! Thank you for coming by and leaving a comment. We love your party.